Vishnu Bhagvan is depicted as a handsome, dark skinned man with a well built physique, with four hands. Each of his hands holds a Chakra (discus), named “Sudarshana”; Sankh (conch shell), named “Panchabhoota”; Gada (mace), named “Kaumodaki”; and Padma (lotus flower). He is identified as sitting, standing or laying on Shesh Nag (the King of Serpents). He can be also be found sitting on Garudji (His chosen vehicle). 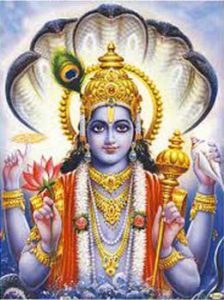 Vishnu Bhagvan is part of the Hindu Holy Trinity, Bramha, Vishnu, and Mahesh and is his consort is Laskmi Devi.